The U.S. bank prime rate remained unchanged in the first half of November at 3.25 percent. This continues the general market trend of low interest rates. The Federal Reserve also reiterated its commitment to low interest rates in a statement following the Nov. 2 meeting of the Federal Open Market Committee. The Fed's reasoning is that monetary stimulus, in the form of low interest rates, is needed because unemployment is still high due to slow economic growth. Meanwhile, the Fed feels that inflation will moderate, despite the fact that it has risen over the past year. In short, as long as the Fed is more concerned about unemployment than it is about inflation, it will continue to favor low interest rates. The reason the mood has alternated between the two in recent weeks is that a relatively strong U.S. GDP growth report at the end of October was offset by concerns over possible sovereign debt defaults by Greece and Italy. As evidence of these mood swings, long-term bond rates had climbed to a two-month high by Oct. 27, only to lose 0.40 percentage points in the next three days. Bond rates have since settled in between these two extremes. Despite all this action, credit card offers in our survey remained unchanged across all categories in the first half of November. While credit card rates will ultimately respond to long-term interest rate trends, credit card companies do not want to be constantly adjusting rates to short-term market fluctuations. Because of this, until a more sustained interest rate trend develops, credit card rates should remain close to their current levels. Credit card offers in both the consumer rewards and non-rewards categories were unchanged in the first half of November. This continues a fairly stable trend for consumer credit card rates, as non-rewards rates haven't changed since early September, and consumer rewards rates have changed just once in that time period. 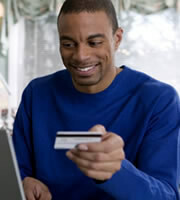 Student credit card offers continued a run of consistency which has seen them remain unchanged since the end of August. That period of stability has conveniently coincided with the school year, giving students and their parents one less thing to worry about while classes are in session. Business credit card offers have been even more stable than the other categories of credit cards, with average non-rewards rates changing just once since late July, and rewards rates just once since late June. That kind of stability can be good for business managers, as they don't have to continually revisit decisions about which cards offer the most competitive interest rates. Credit card rates in general should respond to sustained interest rate trends, but rates can also vary based on the credit ratings of cardholders. The spread between average rates and rates for people with strong credit histories remained at 4.07 percent--quite a healthy interest rate advantage for people who have maintained good credit. 0 Responses to "Credit card rates stable in turbulent times"